Beads can be a great addition to art jewelry. Making your own beads can be beneficial in numerous ways: first, you can make the bead holes exactly the size you need. 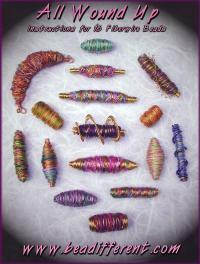 Secondly, you can make fiber and wire beads any color that you need for just that perfect piece. 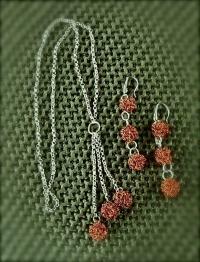 Lastly, you can make your entire piece of art jewelry out of wire beads, wire and fiber beads or a combination of both. In any event, being able to make your own beads allows you greater flexibility and enhanced creativity in making any of your own art jewelry pieces. 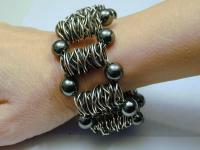 CB01 - One of the best selling tutorials, this wire bead cuff project with step-by-step photos, is assembled using a simple “s” weave stringing technique with wire. Simply make and darken your wire beads according to the instructions and then string them as shown. 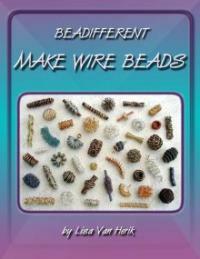 PEN01 - Learn how to combine wire beads that you make yourself with chain. Once you start combining these two simple elements, be forewarned because you may not be able to stop! Honestly, there are many different ways to combine beads and chain so here's hoping this tutorial will help you get started.